Cream of Cauliflower Soup WILL NOT SELL. That is what I was told by a number of people. Some restaurant guests have said they do not like cauliflower very much and even the thought of such a soup "turns them off. Determined to make them re-think their view, here is what we did at the restaurant. 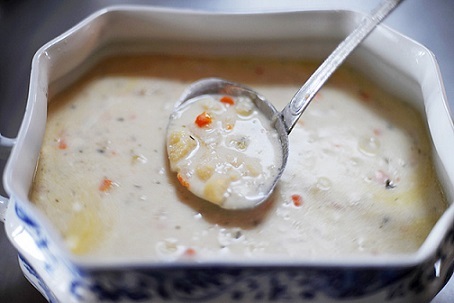 We made a small batch of this soup using this recipe. Food servers explained to the restaurant guests that we wanted them to try the soup- for free. Many of the guests decided to do so and we gave them the equivalent of 2 soup spoons of the soup. What do you think happened? 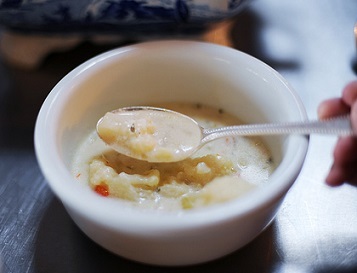 The guests were surprised at the mild and creamy flavor of this soup. Nearly everyone who tried the soup said it was delicious. They ordered a cup or bowl of the soup and enjoyed every bite. 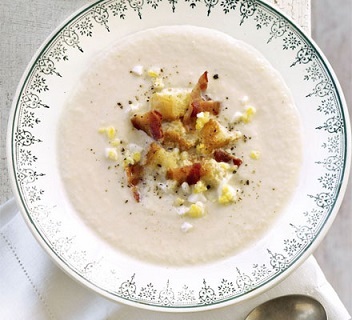 This recipe for Cream of Cauliflower Soup has been a real restaurant recipe ever since that day - years ago. Note: This recipe has about 7.35 grams of carbohydrates per serving assuming 4 servings for the recipe as specified and that includes 1 tablespoon of chopped green onions per serving as the garnish. You have got to try this soup recipe! Garnish the soup with some chopped bacon! If you reheat your soup and find it a little too thick you can thin it by adding a little chicken stock to it. Try this soup with a favorite Bran Muffin. Double YUMMY! Serve and enjoy your delicious, nutritious Cream of Cauliflower Soup and the company of those you share it with! "Cauliflower is nothing but a cabbage with a college education."